Construction quality is another matter. There is nothing about this speaker which suggests it is built to its price, and you’re reminded of this when you try to move it – at 31kg a pop. On closer appraisal, the drive units look anachronistic, and that’s because they are – especially the midband. The Gloucester company began its life building drive units for professional monitor speakers, and then started making its own. Billy Woodman, founder of ATC, seems as fascinated by transducers now as he was forty years ago when the company was born, and the SCM40 has a dome mid unit unique to this marque. Very few companies make midrange domes these days, because they’re hard to get right. Instead, most prefer to use a small version of a coned bass driver to handle these frequencies. The benefit of a dome, as well as excellent dispersion, is that it is phase-coherent with the dome tweeter – which is to say that it radiates sound waves in a similar manner. This brings excellent integration to that critical tweeter/midrange driver relationship, and you can hear it in every speaker so designed, from the classic Yamaha NS1000M to the SCM40. This 75mm soft dome mid driver uses a hand-doped acrylic diaphragm and suspension system, using a “secret ATC formula”. It mates to an ATC designed and built 25mm dome tweeter with a doped polyester diaphragm and suspension, with alloy wave guide. The bass driver is 164mm in diameter and features a hand coated paper pulp diaphragm, chosen for its balance of low mass, damping and rigidity, and there’s a huge motor assembly behind. A three-element crossover is fitted, comprising a low pass filter, band pass filter and high pass filter. The efficiency of the system is set by the bass driver with the mid and HF padded down accordingly, the company says, so it’s kept as simple as possible – this is achievable because the drivers are designed around it. As with all ATC three-ways, the crossover points are 380Hz and 3.5kHz. One problem with this speaker is that it’s not particularly easy to drive. ATC says its impedance curve is flat, so the amplifier shouldn’t require Herculean reserves of current, but it sure does need watts! Quoted sensitivity is low for a big box – 85dB/1w/1m – which means over 60W is the order of the day. I tried several solid-state amplifiers (valves need not apply), and all got hot and slightly bothered at very high volumes. This is in part because ATC has gone for an infinite baffle cabinet, which asks more from whatever is driving it. There are too many loudspeakers describing themselves wishfully as ‘studio monitors’, but here we have something that is far closer to this than most. This big (265x980x300mm floorstander is unerringly revealing of what you put into it, and certainly doesn’t sugar the pill. But if you imagine that it is cerebral, analytical and dispassionately forensic then think again. Feed it a high quality source via a smooth, punchy solid-state amplifier and you get a startlingly fine sound back. In essence, you get a large, wideband sound that’s starker and more open than anything else I’ve heard at this price. This is made more apparent by its superb bass; arguments rage about the relative merits of infinite baffle boxes but ATC has got this one working brilliantly. The only downside is that it makes lesser amplifiers feel like a jogger running in concrete sneakers! For example, Kraftwerk’s Tour de France Soundtracks was breathtaking – rarely have I heard this album’s low frequencies in such sharp relief. 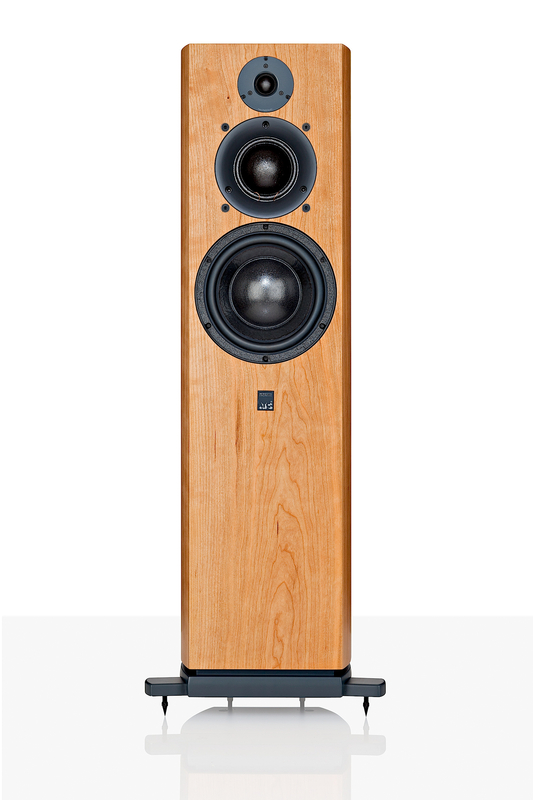 Positioned just 30cm from my rear wall and toed in slightly, the speed, power and grip was superlative – it easily outdoes more expensive big boxes like Spendor’s D7 or Sonus faber’s Olympica II. The attack transients on the synth bass were superb, starting and stopping with the speed of an LED. On songs with vast tracts of low frequencies such the Moog bass on 4hero’s Cosmic Tree, the bottom end is rock-solid, prodigious and ultra tight, but give it an indie guitar track like REM’s Maps and Legends and the speaker is relatively circumspect, refusing to over-egg the pudding so to speak. Basically, it tells you what’s going on if it is going on, and if it isn’t then it doesn’t. This is the mark of a serious wideband monitor loudspeaker, and a reminder that so many of today’s reflex ported designs simply aren’t doing bass right. Not so the SCM40, and the way it integrates its superb low frequencies with the midband is a joy; in this region it’s more searching than many, but is never harsh unless the source and/or song is too. Rather, it sounds like a veil has been lifted from in front of the music and it gives an explicit insight into the proceedings. I was impressed by how deep it dug into Thomas Dolby’s Airwaves; it’s a lovely song but the track isn’t the most clearly recorded and sounds a little veiled by modern standards. But the SCM40 eked its way into the groove and threw out loads of information; it set up an accurate stereo soundstage and hung images back when needed, but projected well when called upon so to do. The speaker proved highly coherent in its handling of phase, everything snapped into focus and arrived at the right place and time. Despite that big, prodigious bass, you would not call the ATC warm. Indeed, the speaker has quite a revealing balance that isn’t afraid to ‘do’ bright when the recording and/or the ancillaries dictate. Treble is airy, spacious and well etched. The looped hi-hats on Beatmasters Who’s In The House? were crispy and scratchy, which is just how they should be because they’re courtesy of an ancient Roland TR808 drum machine whose cymbal sound is precisely this. There’s no gilding of the lily with the SCM40, everything is handed to you in an accurate and unalloyed way. Some may find it bright; it’s certainly a fearless critic of your ancillary components, so if you’ve got some thousand pound separates and you’d like to buy the ATCs to partner them until you’ve saved up for better, then be prepared to be reminded why you need to save up! In practical terms, this is the biggest problem – they are too revealing for most front ends and certainly those in their price class. Most buyers with this sort of money will not want something that tears into recordings – and indeed ancillaries – in such a way. Given a serious source and recording, the latest ATC SCM40 is superb. It strings the rhythmic elements of the mix together brilliantly, punching out subtle dynamic inflections in a marvellously satisfying and visceral way. But then again it will have you fretting about how best to drive it for years to come, because you know it’s capable of a level of transparency you’d normally only expect from loudspeakers at three or four times its price. It’s a great speaker to commit to and build a system around – but if you’re looking for something that’s simply going to make ‘a nice noise’ regardless of partnering equipment and recordings, then others are more appropriate.